‘Flint’, an artist’s summary of the Flint water crisis, has visceral impact on the viewer. This image won an award. Flint Michigan is an old automotive manufacturing town in Michigan, about 45 miles north of my town, Ann Arbor. The Flint population is predominantly african-american. The picture below shows the condition of the water provided by the Flint water system. Every part of this image is a compelling statement about our past and about our very present issues with what is happening in America today. For the past 5 years Flint Michigan has been horribly mismanaged by the Republican controlled State government. Governor Snyder ordered city management to be taken over by direct State control; horrible decisions were promptly made. They disconnected Flint from the clean Detroit water supply that had been used (way too expensive), and substituted water from the local polluted supply, which was much cheaper but was known to be dangerous. Flint children began to show effects of poisoning in 2014. The water is still not clear today. All this must have been way preferable to the original water contract. It is very difficult to say that the governor and his advisers made decisions were not race based. I believe that the “Colored” sign overtly refers to the color of the water being delivered to Flint homes. This is another one of the denotes vs connotes things because it has strong evocation of the U.S. white supremacist laws that were overturned by a Supreme Court decision (60 years ago). That decision began our painful approach toward racial equality. Clearly, we are yet a long way from achieving that goal. 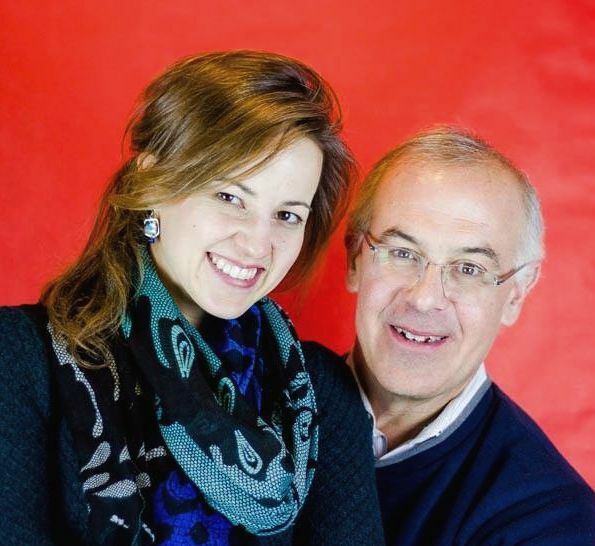 Right winger David Brooks published an op ed column in the 2017 Oct 7 New York Times (print edition) on gun control. His comments have a vital point, and they should be required reading. If you quote hard data that demonstrates a mistake in an attitude, you will not change anyone’s opinion, instead you might strengthen their attachment to anti-real viewpoints. History is full of examples of this, from the spherical vs flat earth argument, the germ theory vs will of the gods arguments, or the current gun rights vs gun control struggle. Logical arguments are as effective as jerking a hook in a fish’s mouth. This does not remove fishhook, it just makes it sink in deeper. We made a similar point when we highlighted Katharine Hayhoe’s climate-change presentation – hard facts do not convince true believers who think that all that stuff is false. This is becoming a recurrent theme for us. Brooks made excellent points, included a link to the book The Influential Mind by Tali Sharot (Director of the Affective Brain Lab, University College London). Her point: If you offer evidence that is opposite to deeply held beliefs and you will not change any minds. True believers will work hard to paint over the objections, even it if requires simply ignoring the data points. The brighter the person, the faster and deeper the rationalizations. We had a chaotic change in our politics. What does that mean? The United States appears to be experiencing an historic shift in its social order. No need for a bullet list of changes, the election of Donald Trump is sufficient to show that people are willing for (actually want?) the change. But, what kind of change are we in for? At the time of this writing, no one can predict where we will be taken by a leader so self centered that he can not recognize the reality of others. We might go anywhere on the political map – from a successful impeachment followed by Republican rewiring of government, to the establishment of a strong-man dictator with the full restructuring of American politics. Trump could not have been elected 30 years ago. But it happened last year. This is not a post about Trump. We will examine chaotic changes and how they happen. This is an expansion of the chaos part of an earlier post, President Trump, Triumph of Chaos. We want to explore what can cause a nearly stable social state of affairs to change. “Nearly” because society’s “state” is only neutrally stable at best; small external forces can dislodge it, and the average central conditions do actually drift over time. You know that any social order is pretty chaotic due to its many interacting and competing factors – any clear and firm position today could change, maybe suddenly. Ocean Ship Strategy – Small tug boats (Fig 1) can bring a huge ship to dock. 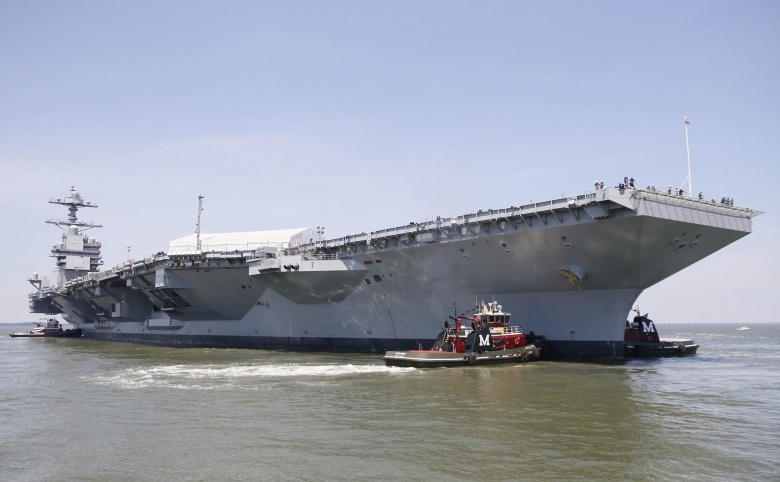 Their low thrust push will move even mighty aircraft carriers up to the dock – but it takes time; tug captains need patience. To get a ship to change course, you must expend a certain total effort. Why not get it over with faster with a bundle of TNT sticks? Same total energy involved. Answer: Bombs yield energy too fast – the idea is to redirect the thing, not sink it. Use a soft push, maintain a controlled speed. Ocean ship strategy results are predictable. If the tug stops pushing, friction with water slows the ship. This provides a stabilizing negative feedback, and the docking process is smooth and gradual. Gradualism allows changes to be predictable. Ought to, at least. How do you know an initial gradual start will stay smooth and gradual? 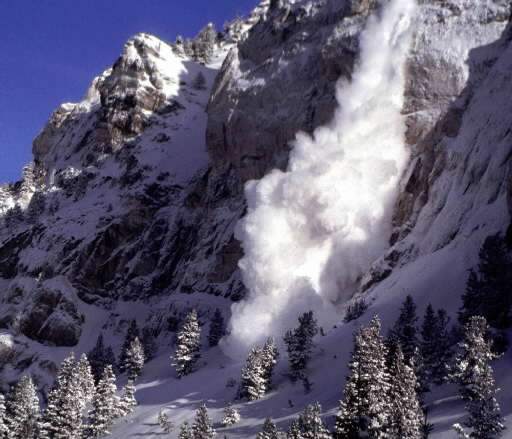 Avalanche Strategy – Avalanches (Fig 2) begin with a tiny bit of snow rolling down a hill. The core picks up volume, excite other snow/ice bits to move, until the ensemble is a moving mass that cannot be stopped. No one knows exactly what the end effects are. How will the hill and valley be changed? Rule: do not use an avalanche for landscape architecture. Results from the avalanche strategy cannot be predicted exactly. This is unlike the ocean ship strategy. There is no similar resistance to growth for a rolling/sliding chip of ice, and results are not gradual. If the temperature, slope and other factors are correct, and if the initial material in motion can pick up enough momentum, the result will be roaring growth to the slide – chaotic change. The long awaited fusion test bed, ITER, is under construction. The facility buildings are well on the way towards completion and machine assembly should begin in the last months of 2018. We discussed the ITER machine structure and various fusion concepts in our ITER-1 post – we will not repeat them here. 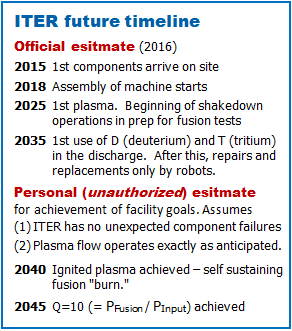 Comment 1 is the currently expected schedule for ITER operations. The official timeline is reasonable – The 2025 and 2035 targets allow for a reasonable break-in with this new machine. Assumptions behind the personal estimates – No operating issues arise during start up trials. (1) Operation schedules base on impatience – Pushing boundaries without checking. In the 1980s, the fusion flagship, TFTR, powered up its TF coils too high and too soon; one of their big coils broke … issues. (2) Hoping without testing. ITER is a major jump in capabilities. What if long-lived, fusion-hot plasma is operates somewhat differently from short-pulse hot plasma? Our question – Do the techniques chosen to remove waste heat (power) and particles form a basic issue that is a background worry to the physics staff? Maybe. 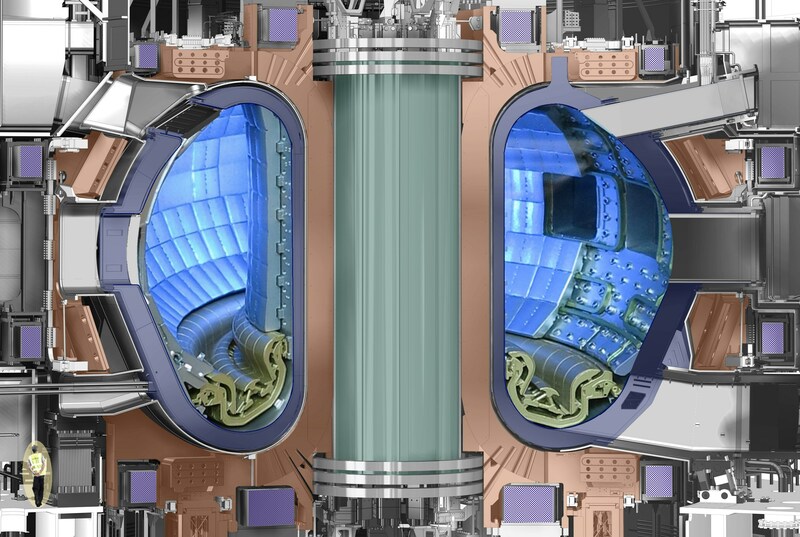 The technique to remove the waste heat and particles that flow from the fusion region relies on an array of divertors, that is, on the material surfaces that the plasma strikes first. Will divertor operation become an functional issue? This is what we discuss. Waste heat The intense heat from the fusion core will conduct out to its edge (the separatrix) and will cross into the unconfined field volume called the scrape-off-layer (SOL). In Fig 1, the separatrix is the green field line with the sharp × point, it separates the confined plasma from the unconfined. The SOL is the dark (brown) much cooler plasma outside the separatrix. 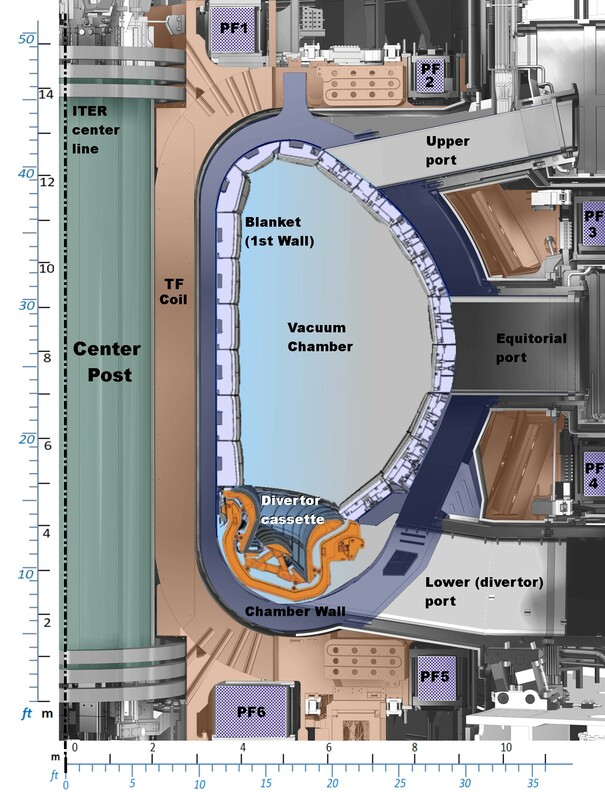 See ITER-1 for a more complete description of the tokamak. Most of the heat flows along the separatrix and out through its × point but some will enter the SOL to cause wall erosion. Wall atoms can/will •diffuse into the plasma, •absorb energy, •radiate “like mad,” •cool the plasma, and •quench the fusion. ITER will begin fusion tests within a decade. We discuss this huge machine. The long awaited fusion test bed, the International Thermonuclear Experimental Reactor, is under construction in Cadarache, France. ITER is an hour (70 km) North of Marseilles (South-Eastern France, not far from the Mediterranean). The facility construction is on-going in France and the machine components are being assembled all around the world. The ITER team has ambitious goals. This is to be the first magnetic fusion machine to hold a stable plasma for 10 minutes. (They plan to extend operations to 1000 seconds, abut 16 minutes.) 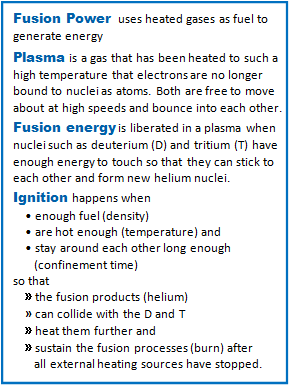 The fuel will be deuterium (D) and tritium (T); D is a stable type of hydrogen (H), twice as heavy as H. Fusion techniques are discussed toward the end of Stirring The Pot. It will reach fusion temperatures (about 150 M° C … 300 M° F) and ignite. Their goal is to use their ignited plasma to generate 500 MW of output power with a device efficiency of Q = Poutput/Pinput = 10. See Comment 1. JET: Poutput = 16 MW, Q =0.67 . This is hotter than any welding torch in any shop anywhere. Hotter than the center of the sun. Good thing, too, since the sun has to last tens of billions of years. If the sun had ITER temperatues, it would last only a small fraction of that. 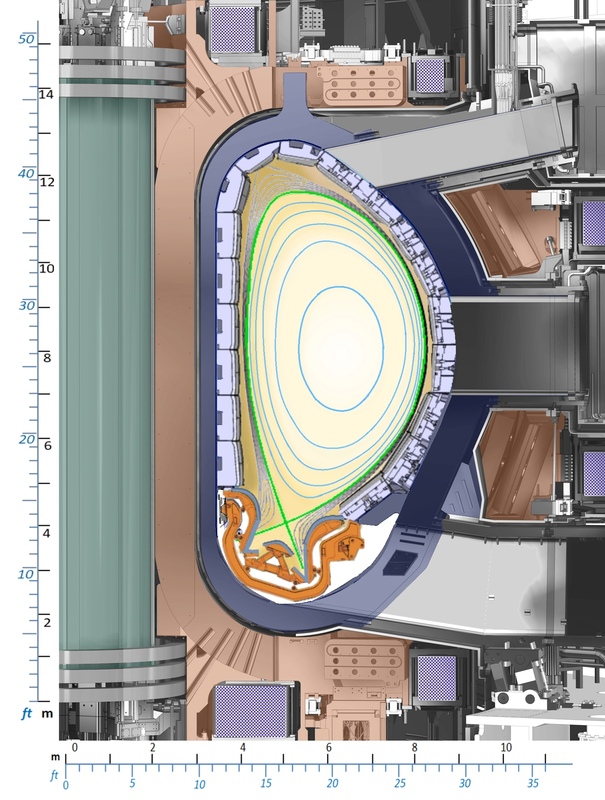 In this post, we describe the ITER tokamak. In our next ITER post we will use this discussion to describe a potential design feature that may limit the success of the program, though not until they have tried to reach their goals of fusion temperature; efficiency, Q; and burn times (15-20 years from now). ITER, the pronunciation Most people in the business say eat-er. You are allowed to say it anyway you want, just be consistent. ITER, the acronym The program started up in 1988 as the International Thermonuclear Experimental Reactor. It was an English abbreviation and the central words were thermonuclear and experimental. Although pretty good, the word nuclear had to go. 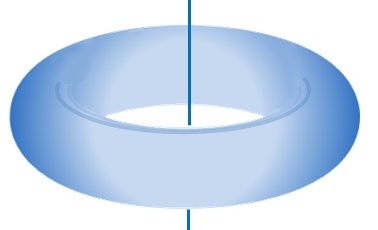 The T stands for thermonuclear and could have been changeable to tokamak; its shape is a torus – Sketch A. (Looks like a bagel, a donut, or a car tire). The E is the important part. This machine is truly an experiment to test out ideas, not a prototype for a mass produced product like a car. But… after 120 years of building automobiles, companies that release a new model require thousands of prototype parts and vehicles for destructive testing. Thousands(?) – not going to happen. Definitely not a prototype. ITER, the history It started in 1988 as a joint venture of 4 countries. The U.S. pulled out maybe a decade ago, then rejoined; nearly withdrew during the Obama days; our DOE just lost significant funding – want to make a bet on our presence 4 years from now? BREXIT may remove the last English speaking country. The countries currently on its guiding council are shown in the logo. ITER is the chosen name because it is dead Latin for The Way. ITER, the tokamak ITER’s goal is to generate 500 MW of fusion power; support a fusion burn that lasts for 10 minutes (they will try for 1000 seconds, about 16 min); and produce 10 times more power than used by the facility (Q=10). The machine to ultimately perform these is shown in Fig 1. The left side shows its interior lined with its protective first-wall blanket. The right side depicts the blanket being installed. Click any figure, to see a full sized image. The colors are for identification; unless someone uses a paintbrush, the actual ITER will be metal toned, from dull to shiny gray. Unless otherwise stated the source of the figures originate with ITER.org. We have modified and colorized most, but the basic drawings for the images are from ITER organization. Today’s SkepticalScience.com has a link to one of Katharine Hayhoe’s latest videos. Facts don’t convince. 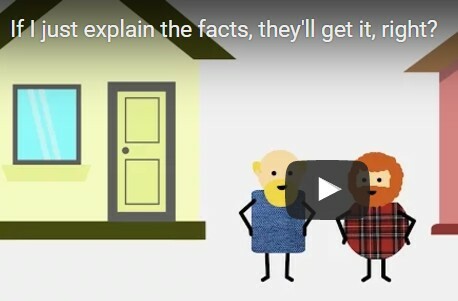 This video (Fig 1) is a very solid description on why you cannot come up to someone, just explain the technical facts about something, then expect them to change their ideas – change their acceptances, their beliefs, their feelings of happiness or anger. This is very true, and the person becomes less amenable to facts, the more technical training they have. 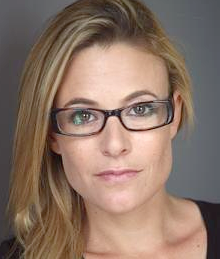 She uses global warming as her topic, but it is true throughout all experience. Her reasons are _ well, watch it for yourself. Oh, brother, do I agree with her discussion! Our last two Global Warming posts were not to change anyone’s attitude; but to explain to those who want to accept the inevitable that it is okay to say that climate change destruction is new, horrible and is our doings.